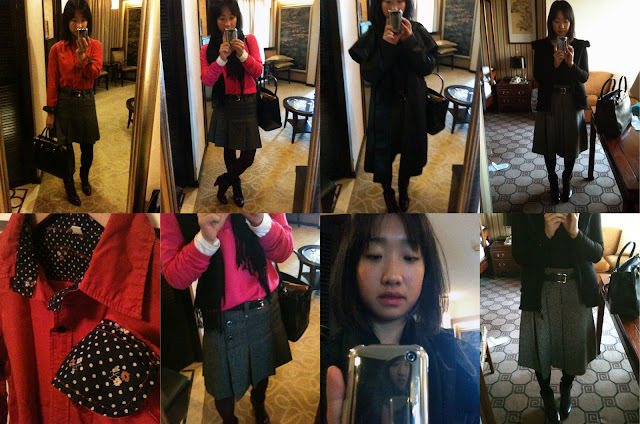 I sneaked in a few snapshots of my daily work attire in the wee hours before I headed out to meetings last month on my business trip to Shanghai and Beijing. My number one motto is pack light! The worst part about traveling is having to lug around what sometimes feels like a steel anchor. The worst-worst part about traveling is having to lug around two steel anchors and forgeting one in the trunk of a taxi. Lesson learned. So in the name of packing light, I am proud to commit what is considered a fashion faux pas--wearing the same pieces out consecutively day after day. It's not a fashion faux pas! It's smart traveling and you looked chic! I don't think it's a fashion faux pas either. When I put together an outfit that I love, I wear it for 2-3 days straight. Even le hubs has gotten used to it and doesn't think it's weird anymore.